MainAll NewsForeign AffairsRecognition of Jerusalem to replace US Embassy move? Recognition of Jerusalem to replace US Embassy move? US official tells Arutz Sheva recognition of Jerusalem as capital would partially fulfill US President Trump's promise to move US Embassy. A US government official speaking to Arutz Sheva on Saturday night said that if US President Donald Trump recognizes Jerusalem as Israel's capital, moving the US Embassy from Tel Aviv to Jerusalem will be delayed considerably. 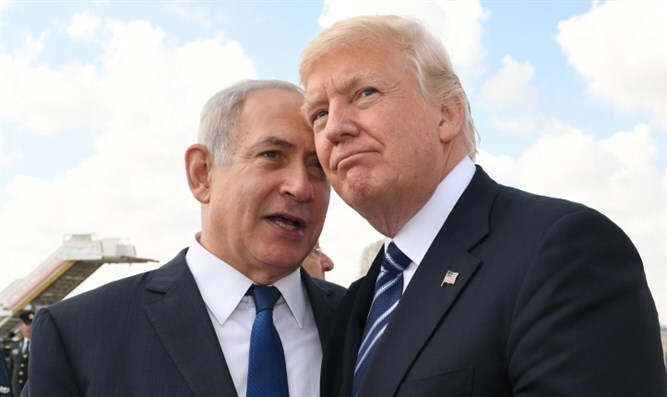 According to the source, "The President has been speaking for some time about officially recognizing Jerusalem as Israel's capital, as a way of partially fulfilling his promise to move the US Embassy to Jerusalem." "Trump's announcement would allow him to sign a waiver deferring the Embassy move, as previous presidents did, while allowing him to continue advancing talks between Israel and the Palestinians." In recent days, there have been several reports claiming Trump will declare Jerusalem as Israel's capital next week. However, the White House has not officially confirmed these reports, and several of Trump's close advisers oppose the actions. Nabil Abu Rudeineh, official spokesman of Palestinian Authority (PA) Chairman Mahmoud Abbas, on Saturday warned of repercussions should the US recognize Jerusalem as Israel's capital. "Eastern Jerusalem will be the capital of a Palestinian state, and any change in the status quo or international recognition legitimizing the Israeli occupation will negate any possible just solution [to the Israeli-PA conflict]," he said.